Huge Asteroid Makes Its Closest Pass To Earth Today : The Two-Way The space rock, which is nine times the size of a cruise ship, is dropping by Earth and it's not coming alone. Asteroid 1998 QE2 has already given scientists a surprise: It has its own moon, measured at about 2,000 feet wide. 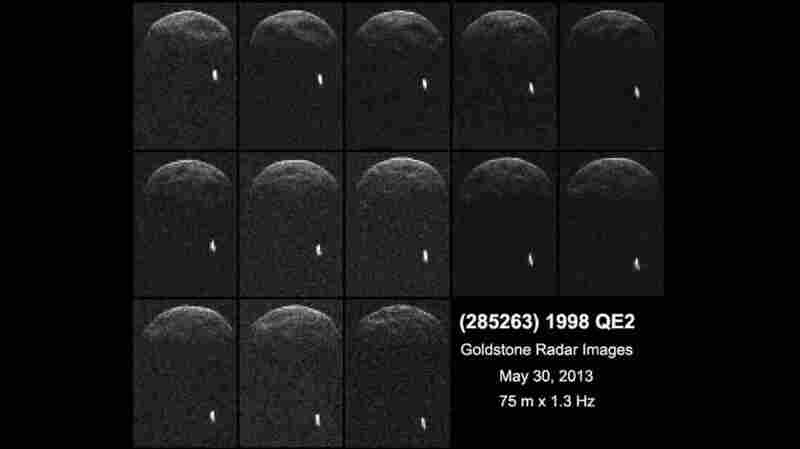 Radar images of asteroid 1998 QE2, taken when the cosmic traveler was about 3.75 million miles from Earth, revealed that the asteroid, with a 1.7-mile diameter, has a moon or satellite revolving around it. An asteroid nine times the size of a cruise ship is dropping by Earth on Friday, and it's not coming alone. Asteroid 1998 QE2 will be about 3.6 million miles from our planet at its closest approach. And its proximity has already given scientists a surprise: It has its own moon, measured at about 2,000 feet wide. The fly-by will mark the closest the asteroid comes to Earth for at least the next 200 years, according to researchers at NASA's Jet Propulsion Laboratory who led the radar observations that spotted the asteroid's moon. The point of maximum proximity will come at 4:59 p.m. ET, or 20:59 UTC, Friday, according to the space agency. "In the near-Earth population, about 16 percent of asteroids that are about 655 feet (200 meters) or larger are binary or triple systems," according to NASA. "Radar images suggest that the main body, or primary, is approximately 1.7 miles (2.7 kilometers) in diameter and has a rotation period of less than four hours." Unless you can access a powerful telescope, you won't be able to see the asteroid, much less its lunar tagalong — 1998 QE2 will pass no closer than 15 times the distance between the Earth and its moon. You can watch live video of the asteroid's passage at Space.com, where a webcast will feature video from the Slooh Space Telescope and the Virtual Telescope Project. NASA TV hosted a special video on the asteroid Thursday; the agency also recommends the hashtag #asteroidQE2 for those wanting to share thoughts about the asteroid on Twitter. For amateur astronomers, NASA recommends trying to view the asteroid in the first week of June — particularly June 3 and 4 — when its sunlit side will face the Earth. As for the appearance of 1998 QE2, NASA says it reflects only 6 percent of the light that hits it, making it blacker than coal. In stories earlier this month announcing the approach, NASA seemed as though it was trying to ease alarmist fears of a cosmic calamity, predicting that the asteroid "will sail serenely past Earth." In February, news that a smaller asteroid — 2012 DA14 — was passing by Earth caused a surge of interest, particularly as it came on the heels of a meteor that exploded as it streaked across the sky in Russia. The 1998 QE2 asteroid was discovered less than 15 years ago, by the Massachusetts Institute of Technology Lincoln Near Earth Asteroid Research (LINEAR) program in New Mexico. The asteroid has not yet been formally named — its current designation reflects a naming convention stemming from its discovery. While 1998 QE2 has been deemed safe, NASA says it's keeping an eye out for any possible threats to Earth posed by asteroids. In addition to developing plans to deflect or even possibly 'shrink-wrap' an asteroid, the agency is planning a mission to study another asteroid in the coming years. "In 2016, NASA will launch a robotic probe to one of the most potentially hazardous of the known Near-Earth Objects," the agency says. "The OSIRIS-REx mission to asteroid (101955) Bennu will be a pathfinder for future spacecraft designed to perform reconnaissance on any newly-discovered threatening objects."